Ed Mendlowitz is a long-time CPA and a partner of prestigious Withum Smith+Brown. He’s also a member of many CPA societies and has taught financial and accounting courses for 11 years. He’s a firm believer in CPE and uses his CPE training opportunities to network with other CPA’s from around the world. He’s full of wisdom and insights and he shares many great nuggets with us today. How important it is to elicit ideas (even crazy ones) from your team. Pete: I’m so excited today, I have an opportunity to speak with Ed Mendlowitz part of WithumSmith and Brown. As you heard in the intro how we met and actually this is the first conversation we are having since connecting many years ago on LinkedIn. First and foremost, Ed, thank you for taking time and thank you for participating in this podcast. I know that you’ll bring a lot of wisdom nuggets and wealth of knowledge that my audience will be able to use so I thank you. I greatly appreciate you and welcome to the show. Ed: Hi Pete. Nice to meet you. Pete: Thank you very much and nice to have you here. Ed, why don’t we start off by you just giving, telling the audience a little bit about yourself. Ed: One of my favorite subjects. Basically, I think that I am the least of the expert generalist. Right now everybody is specializes, everything is a specialization, niches, leadership in different specific fields. I started out a long time ago and I figured out that the only way I could grow and build this small practice was if I never turned down business. So whatever came my way I set I would do. I literally have done, I can’t say did everything that it counts but I think I’ve done as much of what accounts to as anybody. I certainly am a note to tax expert. I testified at congress. I’ve written quite a few books on taxes. I’ve been a team captain doing peer reviews of CPA firms. I got every accreditation at the AICPA in South. Take about 140 credits a year. People think about taking CPA I love taking CPA because I meet great people. I learn new things and expands my knowledge. I do business evaluations, forensic work. I had a small firm. We did the lowest level work that CPA’s could do. Which I would say is Quickbooks consulting and we did the highest level of CPA skill which is for the companies and we are partly SCC practice section at that time. My range is great, it’s wide. I’ve been very good at training people. So once I developed an expertise, I would have one of my people CF become an expert in that area. And then I would stop doing it and the I’m going to the next thing. So I have a very interesting career, I still do. I enjoy myself, like everything I do. Monday is the best day of the week because I look forward to five full days of work. Friday is a downer because I have to stop working for a couple of days. We merged in with WithumSmith and Brown 11 years ago and it was 14 people in my firm. It was three partners; it was me and two other partners. We have everyone of the 11 staff we hired and trained. Nobody came to us very experienced in what they were doing. It includes the accountants, the bookkeeper, the administrator personnel and the marketing person. I’ve become very good at training and a very successful, one of the reason I’ve become successful is I get people to do my work. I get them to do it my way and so I’ve been an entrepreneur in accounting. Started to practice one of the guy 14 years later, we had the third partner. We had 50 people. Ed: Working for us. I left it from the small firm which is when I merged in with Withum 11 years ago. That’s the short version of my background. Pete: It’s an exciting background and you are a part of WithumSmith and Brown, my first introduction to your firm was through Youtube. With the videos that you guys do, stated the firm and I will have to say my jaw dropped the first time I saw it. A very progressive, a very out of the box, non-traditional accounting perspective and I do believe I spotted you in State of the Firm 2014 it was that you were part of that video shoot. Is that true? Ed: Yes, I was in all the video, except I was not in the last one because the list before that I was there. I didn’t take a prominent role. I was there but you couldn’t see me. And the last one, I figured my time has come not to be in it but a bunch of people where in it. It’s an amazing thing [Sarah ?? 5:10] runs a social media. She actually post my blogs. Whatever I write, I say fire and she posts it and gets it out there and tweets it and all the social media stuff. But I tell you the videos, one of the things that came out of the video which I think may have been consequence has become a tremendous vehicle recruiting younger people. Ed: We did it to introduce our firm. To excite our staff. To try establish and landing get clients and has become unbelievably valuable in attracting staff. People call us, good people. We hire a lot of people. My office alone, the forensic office, we hire at least seven or eight people every year out of school. And then we have about a dozen interns throughout the year. There are times working in our office. We used to recruit to get them and now a lot of people call us. This thing is great. Pete: My impression of it when I first came upon it, it was there for a recruiting tool. That’s what I thought. In all honesty, the first time I saw the video, after I picked my jaw up because it was outstanding, so different. It was so fresh. It had that feel that you were trying to attract those students coming out of school. The younger Gen Y’s group. I think I was 53 at that time when I saw it and I went, “ Am I too old?” to go back to work and pop it in the can because that excited me. There was just excitement in that video that it just really resonated with me that to me, I interpreted it this is the way the profession is changing in a way. Versus it wasn’t the old hardwood type of look to it. For those of you in the audience, go out to Youtube and Google WithumSmith and Brown or directly to their website and you can see these videos. From a 100% partner firm, it’s pretty impressive. Ed: Thank you. I think the original, I wasn’t in the planning but we have a stated a firm meeting every year at the beginning of January. Everybody comes, in fact this January we just merged in a Florida firm with a 110 people and over a 100 people flow in from Florida to attend our State of the Firm meeting in January. So we got to meet a lot of partners and staff. But I think the main emphasis was to excite our staff. We hire people and we wine and dine to get people to work for us and then sometimes treat them good and same thing with clients. A lot of accounting firms they go out of the way, they’d do anything to get in the client. They’ll leave the meeting, they’ll leave the kid’s softball game, if they had a meeting with a new client they would do that but they don’t pay attention to their existing clients. If they paid attention to the existing clients the same way with the same effort and interest to get a new client. They will get a lot more business from existing clients and the firm will grow and the existing clients will do all the recommending. Referrals to them. So offering bidders and we continuously do it because we have a lot of inhouse programs that are really great. We have [shell/shared 8:55]stock program. Staff could actually own fathom stock in Withum and sharing the growth of it. I think that we wanted to excite our staff and I guess exciting staff is exciting young people and it leads to recruiting. In the first video, you can see me dancing on the table. Pete: I’m gonna pull that up after we’re done. Ed: I was [inaudible 9:23] wearing but you can see me. Pete: That’s great because when I’m hearing you talk about as we have to take care of our people. There are two types of people. Our staff and our clients. I say this in a lot of the presentations I do especially at conferences when I have a crowd there. I’ll ask the query- What business they are in? I hear consulting, I hear tax serves, I hear auditing, hear this that and I don’t- – No that’s a byproduct of what you do. That’s a byproduct of your business. And then I get them a little uncomfortable. Then I go, it’s really simple people, you’re in the people business without people you have no business. It’s amazing that the looks I get, for some it’s the Aha moment and I think we need to take a look at our people. Sometimes we don’t treat them well. Sometimes we don’t treat our clients well that causes the high turnover. That causes clients to leave and maybe a little bit more paying attention to the needs and wants of our clients as your firm is demonstrating we’ll help with growth. Ed: Let me tell you something about our firm. I’m very interested in the profession. Of course I’ve been very involved in the profession long time. When people leave our firm and some people leave because they’re not happy here. Almost every single person that moves gets a job in another CPA firm. I would say much more than half of the people who leave our firm get jobs on another CPA firms. Take the big four for example, the big four hire 70% of the accounting majors when they graduate college. Ed: In three years, 90% of those people leave the profession. They don’t leave the big four firm to go on another big four firm or they go to a firm like us, a couple do. But they basically leave the profession. The people who work for our firm stay in the profession. I think that says a lot about the firm. I think there’s a lot of firm our size in the area. I know media or anything across the country. Firms outsize the people seem to get jobs to other CPA firms and stay in the profession. While the real big firms, they don’t and of course the very small firms some do and some don’t but I can’t tell you what my experience was when people left me. Because when I have my practice, nobody quit. Ed: A lot of people move and they took jobs in other CPA firms but nobody quit when they work for me. And I wasn’t the nicest guy in the world to be honest with you, but nobody quit. Because they were learning every minute of the time. They were excited. They like the clients they worked on. They like the people they work with and I was just [inaudible 12:30] You don’t have to like your parent to have a nice house. Pete: That’s very well said. One more time, that’s just respect. I talk a lot about that in my book that you don’t have to like the person but you have to have respect for the person in order to keep things moving forward. Once we lose respect, things begin to fall apart within business transactions, within staff, within everything. I may not like the person but as long as I get some respect and I show them that respect things will continue to grow. People will not leave. We will continue to retain those individuals because it is, all about the people. Ed: Certainly over a 100 credits. Yeah, I need to keep up my certifications. Pete: True. But you made a comment about one of the things you liked about going to CPA courses were the people that you meet. Pete: And I do over close to 70 programs a year and one of the first things I start my class of with is – Does anybody in the room know each other? They said, “No”. And I said, “Hope you got your business cards because this is one of the best place to network is in the CPA Event”. I guess some people look at me like I’m crazy and others will take me up on it and will meet somebody new or whatever. But I think that’s one of the best places to network is within CP because we have to take it. Ed: Well, I have met people from all over the world. I regularly correspond and I’ve gotten referrals from somebody I met from Australia at a CPA conference. I have this thing called the partners network. I’m not pushing it. It’s merely more people who are local but I send out a lot of materials. I send out 55 free checklist beginning of every tax season. I have a Q&A that I post. I answered people’s questions. They are practice management questions but most of my referrals come from CPA’s and we’ve built our practice, I built my former practice, with referrals from CPA’s. I did the peer reviews, that is a way of meeting CPA’s and I became their expert in certain areas and things they couldn’t do, they would refer to me. But I really meet people all over the world, all over the country when I go to CPA programs. There are certain people that I see once a year at these programs. We go out to dinner. We hang out and I would say that I never really meet less than 40 or 50 people. I mean meet them. I don’t just say hello and give the business card because you’re there for three days I met an AICPA personal forensic planning conference. This is evaluation conference. I was spending three days with people. I also find thumb with a crowd of people if I met some people that they’re alone, I invite them to join us. 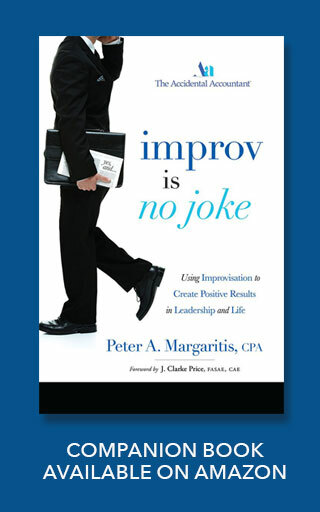 Actually, this past November, we were in Vegas at an AICPA conference. I was with some of my partners and staff and we met somebody from Nashville. She was there alone so we invited her to dinner with us. Well, it turns out that this conference this year is going to be in Nashville. So we now have a friend in Nashville that we will meet and go spend some time with. Accountants are nice people. We’re very cooperative. We respect each other. We call each other. We have questions. Sometimes, I get a referral for somebody in Texas, Houston or something. I work at my list and see who I know and I could give a couple of names to people. It’s a way of helping them and helping the person that needs the referral. The bottom line is oh yeah, people take this virtual courses and I’ve taken some and I sit in my office. I sit on my desk. Sometimes, I’m sitting in my underwear at home taking a CPA course but you miss that personal contact. I was at a course Friday, a whole day CPA program on Friday on sustainability. Actually, I was one of the speakers. They have like 15 speakers and then in the course of that program, I suddenly spoke to 30 or 40 people. I had lunch with one of the young lady who is writing an article for National Magazine. So, now I met a reporter and she followed up already and I’ll keep in touch with her. It could lead to me getting quoted in some other publications. Nothing beats the touchy feeling. I think in servicing clients, we don’t understand that either. We think that we do the tax return great. We get the tax return done on time. We set in a staff person occasionally. We think that’s developing relationship. It’s not. It’s when the partner picks up the phone and calls the client. You don’t send an email and say, “how are you?” Although, I do send emails on people’s birthdays because I figure out that sometimes I don’t want to talk to people all the time. I’ve sent articles to people. You try to maintain a personal touch. If I’m in an area where I have a client, when I’m meeting somebody and have another client in that area, I just pop in. If they’re there, I say hello to them for 10 minutes. If they’re not there, I say, “well, just tell John I was here, I was in the neighborhood.” I want to create availability. Clients don’t care. I think I’m great but clients don’t care if I’m great. They don’t know if I’m great. They think I’m great but what they really like is that I’m available. I returned their phone calls. If there’s a problem, I’m in there and face with it and I precipitate phone calls. I call them with questions, with suggestions. You don’t have to do it more than four or five times a year and they think you’re fantastic. The way you could measure this is very simple. If you get referrals from existing clients, you’re doing a good job in the relationship to partner. If you’re not getting referrals, you may never lose the client because 25 years ago, you help them with their divorce and they’ll never leave you but they stop referring you because you could sit down but they don’t want to recommend you becuase they don’t want to subject somebody else maybe to something that they don’t like about you but won’t drop you. So, the referrals you get from existing clients is the way that you could determine if you’re doing a good job or not. Pete: I think of myself as one of my strong suits is a networker. I love networking. I love building those types of relationships. However, I think I’ve just met the person who has networking plus on steroids because you gave me so many good ideas. I mean some things I’ve never thought about like the one with the person who was by themselves and you invited them to dinner. You’re always making connections, building your network because referrals are the best way to grow a business. I’m going to take some of the things that you said that I haven’t done in quite a long time and reinstitute them because that was an excellent demonstration or a way to prove the power of networking and what it can do. I have to say thank you once again. I sent you my book blind. We got together on LinkedIn. I’ve been following you for quite a while through your writings and article posting in Accounting Today and CPA Trendlines. When I sent you the book, I didn’t know if you would even respond with a thank you, which you did but I’m amazed how many times I sent my book out and I don’t hear even a thank you from people. But you went the extra mile and I’m still in awe that and actually wrote a book review of it. I know I’m still a little choppy in talking about it because it just blew me away that someone would take the time who I’ve never met face to face and never had eyeballs on each other. We’re just somewhat met through a virtual world and would do that but then if I remember correctly, one of the reasons why you open my book is because I have three letters behind name, CPA. Then, you read that we have a mutual acquaintance in there, Dr. Gary John Previts, professor at Case Western Reserve University, which also helped in that connection. If you could just tell my audience some of the things that you found in my book that you’ve liked and been able to apply to your daily life. Ed: Well, first of all, I got the book. I get a lot of books and I always look at them. I don’t always read them but I always look at them.But you mentioned Gary John Previts who right away- You know, by the way, a book I knew Previts is not the highest thing on my list that I would read to be honest with you. But you mentioned Gary and I said, “well, this guy is legitimate,” because Gary is certainly a leader and a champion of accounting history, which I’m a big fan of his. I started looking at the book and then you know what happened, I opened it up to page in the middle. I just opened up something and you were talking about that you say, “instead of saying yes, but. You say yes, and.” I happen to be a very big fan of Benjamin Franklin. He doesn’t know it but I am. When he was younger, he wrote his autobiography, which is still being published today that says a lot about the quality of the book of why people should read it. But he developed the 13-point system of making himself a better person and one of the things that he has in his 13-point system is not saying “yes, but” but in a way saying “yes, and” just like you said. I read what you wrote. It’s just a technique of getting your point across without getting your point across. Helping people buy into your way of thinking being so so argumentative and so [inaudible 24:06]. This book looks good so I read it, I read the book. It’s a short book so that helps. 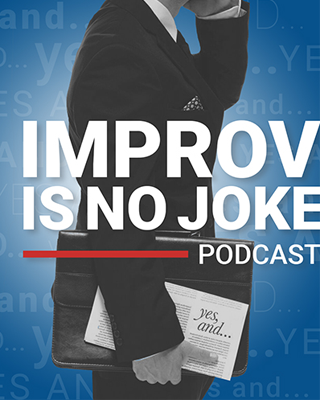 It’s not really about improvisation. It’s not about acting. It’s about communicating. It’s about how do you be a better communicator. You know you mentioned I’m a good networker because I work at it. But I work at it. I put a lot of work. I do crazy things and it’s the personal touch. The personal ability to communicate with people and you don’t have to be a good speaker. You don’t have to have a lot of ideas. Sometimes, you have to be a great listener. You just get people to talk. The more people talk to you, the smarter they think you are. I’m never gonna over impress people of how smart I am if I do all the talking. So this is your book, and it is about taking away. Wise work speak plain just say it the way it is, which I got to I tell you, I write these blogs and the hardest part is to take out the role of fancy words and all the things that I think might impress people because the object is to communicate ideas. If I go write something or if I talk to people or give a speech. People walk away with one or two things that they’re gonna do because what I’ve said I’ve communicated to them. And if they walk away saying, “Boy, this Mendlowitz is brilliant.” I do not communicate because they’re not gonna change their actions. It’s about us, it’s about them. It’s not about the accountant and the firm, it’s about the client and what’s in it for them. And that’s what we’re doing. Your book is a – I don’t want to say textbook because it’s not that scholarly thing that people drudge reading through but it is quick. It is easy. It got short paragraphs. You get right to the point. You got ideas that people could immediately walk away implementing. It’s something that I’ve looked at once again. Since I wrote the article before you contacted me, I looked at it again because you read things then you put aside. If I wanted to get one or two things,which I did. I suddenly implemented that and just add. Even though I knew it, I wasn’t practicing it. I did it. But you said something that’s ingenious and I say this all the time so it make both of us geniuses. Ed: You said that bad ideas lead to good ideas and no ideas lead to nothing. That is so true. When you are in a committee. When you’re in a group. If you could create an atmosphere what people could just spit out the craziest, stupidest ideas and have a chance of coming up with something good. If you stifle people’s’ ingenuity you stifle the participation. You don’t let them participate, and you’re not getting any ideas and you don’t get any ideas, nothing is going to happen. You mentioned a video, who would think that’s a good idea? It’s a crazy idea. If I taught you about the iPhone, you’ll say it’s the craziest stupid idea. We’re on an iPhone right now. 10 years ago, this damn thing did not exist. Ed: And I just got, in the course of this talking to, I got about five calls. This is it! This is how we work, how we live. You know, in December of 1975, I got my first email account. Ed: When you think about it, I remember this December I went to attend a meeting in May hosted by Martin Edelston who founded Bottom Line and the Boardroom Empire. There’s a guy there and he said, “how many people have an email address?” Let’s say there are 20 people at the dinner and I think three people raised their hand. I didn’t know what he was talking about. He said by the end of the year I guarantee everyone of you will be having an email address. I didn’t know what he meant and the day after Christmas in 1995 I signed up for an AOL account. Actually, I signed up for Prodigy account. Ed: The reason I did Prodigy because at that time it was owned by H&R Block [inaudible 29:08 – 29:11] H&R Block’s talking. That didn’t do well and Prodigy is out of business but I still have email. We’re using it. We’re depending on it. Now, they have texting and everything but I like the email. I could actually dictate email on my iPhone. You don’t have to write anything. I was at a golf course yesterday and I got an email. I happened to look at my iPhone, which was stupid. I got an email and I dictated a quick response – I can’t talk now, I’ll call you later. I dictated it so there is some crazy ideas that Columbus discovering America. It was a crazy idea. Ed: When you think about all these things that are going on. Donald Trump becoming the Republican now [inaudible 30:01] was certainly a crazy idea. And every bit of logic that we could imagine would say how he can’t win, especially, given the makeup Republican party and the type of people who voted in the primaries. So, this is your book – bad ideas lead to good ideas. And we got to have ideas. We can’t stifle the participation of people. Pete: Well said. I can’t agree more. I do a creativity course, How to Dump SALY, and find a new creative way. I have the audience of CPA’s and I ask them this question, how many in this room think they are creative? Usually maybe one or two people. Then I’ll go, let me rephrase that question. How many in this room have ideas? All hands go up, then that means you’re creative. Something’s blocking it from getting it out of your mind, onto paper, out into the form and that’s probably two things. Your inner critic telling you that’s a stupid idea, don’t say it. Or you are in a culture that doesn’t embrace that type of creativity. That might poo-poo that type of freedom of thought. That’s just a crazy idea. We can’t do that here. Right there, you just shut the whole creative process down for that day as well as forever because you get embarrassed on a room. I’m not going to take that type of verbal humiliation in front of my peers when I’m asked for an idea but then I’m told that’s a stupid idea we can’t do that and just moving on. So yes, always bring out your ideas. And how to create a culture. If you’re partner and you’ve got to group the staff and you’re trying to figure out how to increase productivity or profitability, you’ll be the one to throw out the crazy idea. You’ll be the one to throw out that bad idea just so everybody else is “wow, that is kind of a crazy idea”. Set the lead, take charge of it and then sit back and watch the ideas sparkle out from these individuals. Then yes, we say innovation.I take innovation and break it into two pieces: creativity and innovation. The innovation is taken as effectively applied creativity. That’s when we can bring judgement into it. But thank you for the review and I would like to ask if I think you and I can probably talk for about 2 hours on almost any given topic and I know you’ve delivered a lot of wisdom and knowledge into this 30 minute podcast. I would like to ask permission to contact you again in the near future and conduct another interview with you on a whole different topic and just let that interview grow. I didn’t think we would end up having such a wonderful conversation on networking when we started this. I’d love to get another conversation with you and just kind of organically grow and be pushed in the direction that I don’t think any of us is planning on. Ed: Sure, this was fun. I enjoyed talking with you. I’m ready anytime. Pete: That’s great. Once again, thank you Ed. I can’t tell you how much I appreciate you taking the time and I appreciate everything that you’ve done for me and I appreciate everything you’re doing for my audience in helping them maybe changing bad habits and create some new good habits. So, thank you very much and I will be in touch because I do have another conversation with you. So thank you again Ed. Ed: Thank you Pete, take care.